Our plugin makes it easy to connect WordPress to any login system. We have them all covered – from Facebook to Google, from Active Directory to LDAP. Our simple dashboard puts you in control – secure your WordPress site instantly. Add Google Authentication, Facebook Login, Twitter and Microsoft Account to your WordPress site. Go beyond with many more including GitHub, Yahoo!, PayPal & AOL. If you can think of it, we can connect to it. Connect your WordPress site in minutes to common enterprise authentication systems like Active Directory, ADFS and LDAP. Something else? We have Azure, Saleforce, Office 365 and any other enterprise system you can think of. You can easily set up multi-factor authentication to secure your site. We integrate with common systems like Google Authenticator and more. Single Sign-On, Passwordless, Rules, iOS,Android and complete control over the look and feel of your login box. 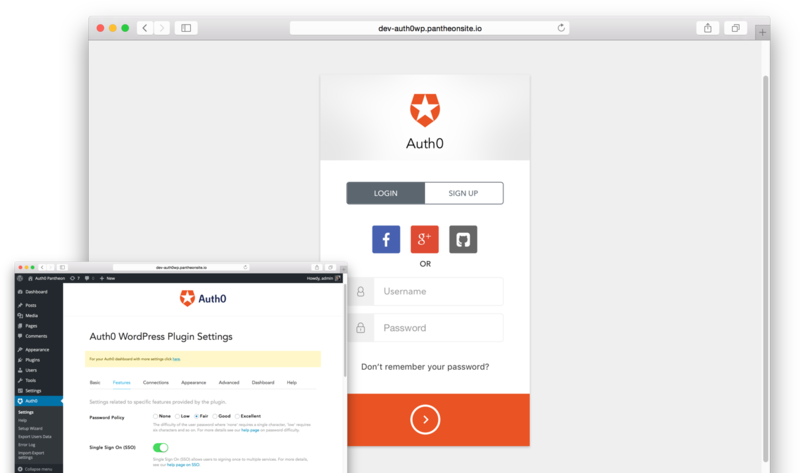 The Auth0 plugin allows you to control and secure your login environment with a simple and powerful settings page. Simply go to Plugins > Auth0 on your WordPress admin page. Explore our detailed documentation, watch our videos, send us feedback and contact us with any query you have.